The most popular fiber cement products are by JamesHardie. They include HardiePlank, HardieShingle and HardieTrim. Fiber cement is a composite material made of sand, cement and cellulose fibers. In appearance fiber cement siding most often consists of overlapping horizontal boards, imitating wooden siding, clapboard and imitation shingles. 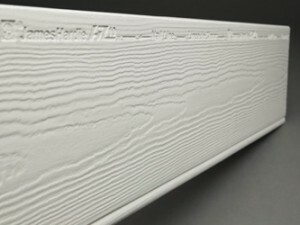 Fiber cement siding is also manufactured in a sheet form and is used not only as cladding but is also commonly used as a soffit / eave lining and as a tile underlay on decks and in bathrooms. James Hardie is the industry leader in fiber cement board production. It is not uncomon for people to refered to fiber cement siding generically as Hardie board,forgetting it is merely a brand name. James Hardie fiber cement siding comes in several different types for different job needs and home preferences. The company sells lap siding, shingle type siding and vertical siding.